After my first 75 miles on the Pacific Crest Trail the thrill of arriving at the small town of Snoqualmie, on Sunday night, was an exciting ordeal. Opening a resupply package I had packed months earlier was akin to opening a time capsule. I emptied the packages content, primarily including peanut butter, wraps, and Clif bars, into my backpack. Living in the wilderness for a week has made me hugely grateful for the ease of modern-day life. With all my food packed for the next week I was back on the trail by Monday morning. Several miles past town I hit Mirror Lake, I could not resist jumping in. It’s cool water reinvigorated me for the miles to come. After breaking for lunch and a short swim I hiked the last five miles to my campsite for the night. A hardly flat patch of ground near an out of use forest service road. However lackluster the campsites I end up settling in are I am always happy to stop after a day of hiking. Stopping to hike is almost as big a part of this trip as hiking is. I get the opportunity to process the incredible scenery of the day as well as the many philosophical and other types of conversations that take place in my head (and sometimes out loud) as I walk. The next evening I ended up at Urichs Cabin. Acting on my fear of being attacked by mice during the night (a fear first instilled in me on my trek along the GA section of the Appalachian Trail) I opted to camp in my tent. That said the cabin is a great sight and likely a fine place to sleep. As I dozed off there where at least ten Elk grazing in the nearby meadows. The next morning as I approached these mammoth creatures to take a picture they fled. A reminder of the fragility within the muscular and imposing. Hiking in cold weather has a somewhat numbing effect on my psyche, making the urge to check my phone (how many more miles to go?) much weaker. Often times towards the end of the day each step becomes its own journey as my mind begins to desire a stop. The urge is not born of physical exertion but rather mental tedium. As magnificent as the mountain ranges I pass are, doing anything for eight hours a day six days a week will become repetitive. 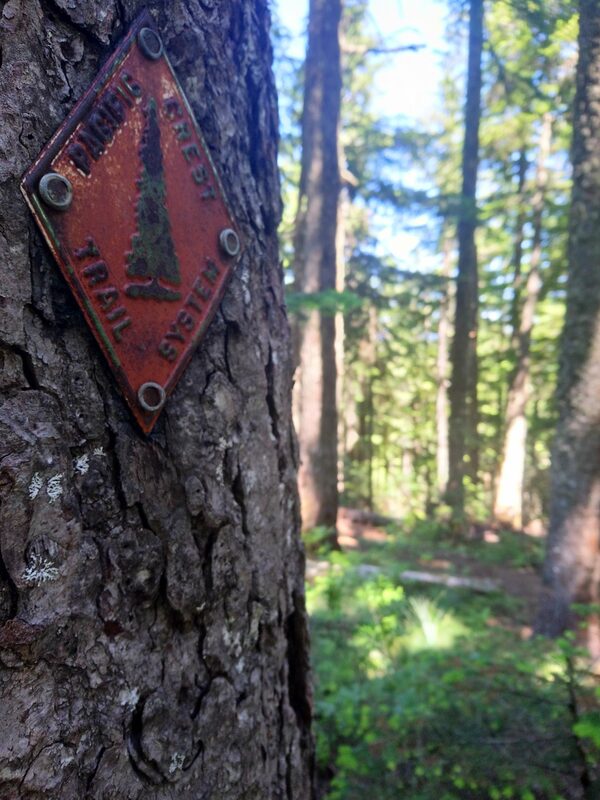 Hiking the Pacific Crest Trail is no exception. Facing this challenge is one of the reason I am on trail. I want to become comfortable with outer ‘boredom’, being able to stay present and content with each moment. It is a big goal but I have a many miles to work on it. 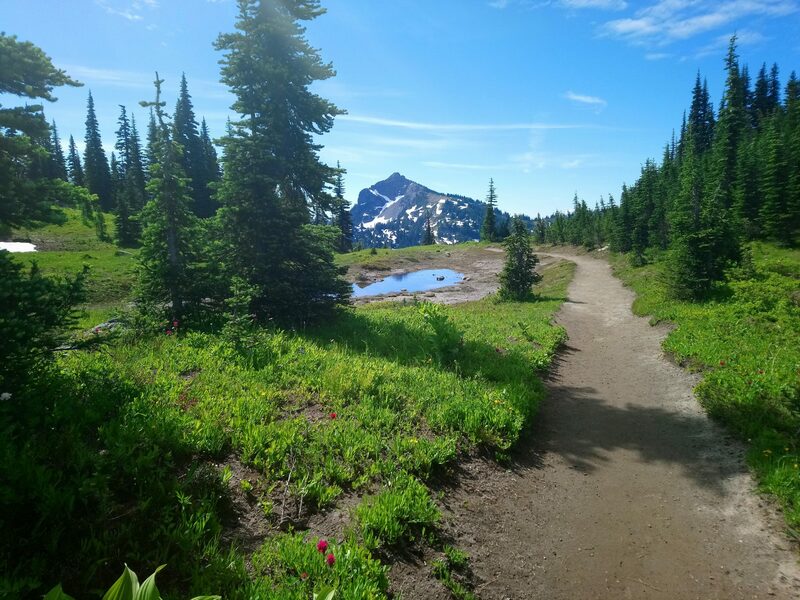 As I walk a huge mountain becomes more clear with each mile, the undisputed king of the North West, Mount Rainier. The last time I was on that mountain I made it to Muir Camp at around 10,000 ft. Seeing it again four years later from a distance brings to mind how much I have changed in that period of time. She has also changed immensely, albeit over the course of her estimated one million years. Mt. 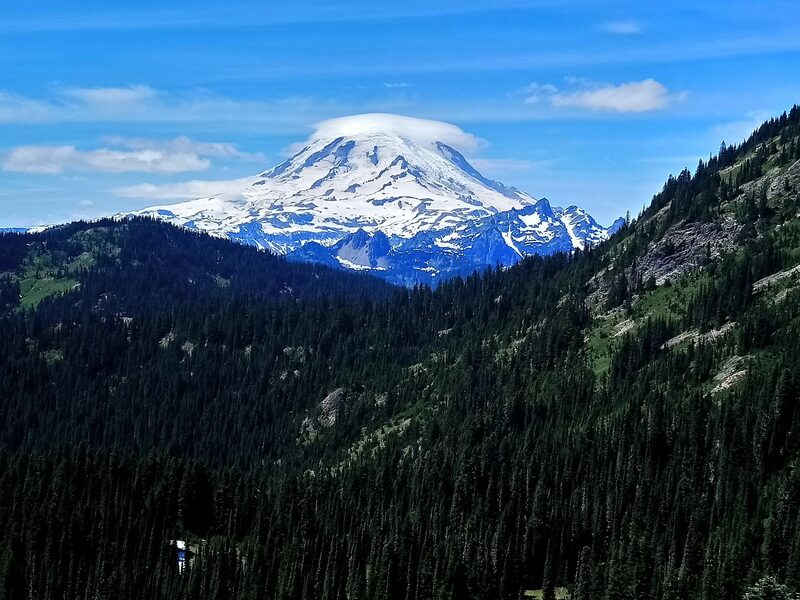 Rainier is said to have lost almost 2,000 feet of elevation due to eruptions, erosion, and the like. Over the past four years one thing has definitely not changed, my obsession with nature. After a few days I finally have a clear view of the ever-changing and ancient mass of matter, an awe-inspiring sight. Eventually I arrived at my weekly resting campsite for Shabbot, Crag Lake. Being late into July the area was buzzing with the mosquito hordes that lurked overhead. I quickly retreated to the respite of my tent and settled in for a night of lonesome song, celebrating the onset of this day of much needed rest. Getting an early start Sunday, I walked nonstop until I arrived at Whites Pass. The push was partly to escape the bugs and partly out of the excitement of getting more food. 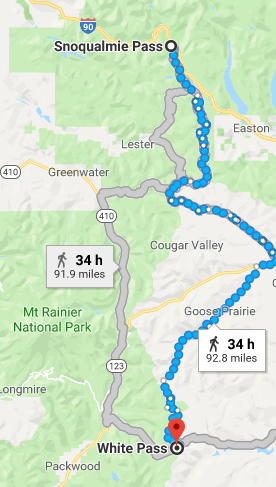 My next stretch is a short 66 mile trek to Trout Lake, where hopefully they have WiFi.